Skagit County stretches from saltwater beaches on the Salish Sea to snow-capped Cascade peaks, with the Skagit River defining much of the regions lifestyle and businesses. Located between Vancouver B.C and Seattle going north or south, and the San Juan Islands and North Cascades National Park east and west, Skagit County is a great place to live. There are jobs in traditional and emerging industries and jobs at the ports. Housing is affordable and the communities care about their schools. The mild climate, ample rainfall and fertile soil combine to make agriculture the top industry. The annual Skagit Valley Tulip Festival launched in 1984 is staged during the entire month of April. The rainbow-colored fields draw an estimated 300,000 visitors. The most recent census of agriculture in 2007 shows the county was home to 1,215 farms covering 108,541 acres. In 2009, the farms grew more than $263 million worth of produce. Although farming is big, the majority of Skagit County residents live in just a few cities, with Sedro Woolley, Mount Vernon, Anacortes being the largest. Search here to find homes for sale in Skagit County, you can search all available MLS listings in the county including single family homes, condos, townhouses, land and many other types of properties whether you are ready to buy now or just starting your search. 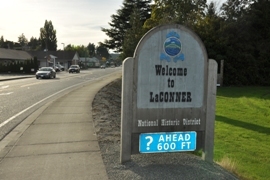 Also, find information about Skagit County schools and nearby amenities like parks, shopping centers, and street maps. Cape Horn on the Skagit Bldg.